New exhibition launched to celebrate 50 years since The Beatles visited India. Beatles Radio: The Beatles, Solos, Covers, Birthdays, News The Fab 4 and More! TO celebrate 50 years since The Beatles visited the Ashram of Maharishi Mahesh Yogi in Rishikesh, India a special exhibition will be launched. Opening on February 16 at The Beatles Story - the new 'Beatles in India' exhibition will discover the secretive part of the story with never seen before memorabilia, imagery and personal accounts from people who were there in 1968. 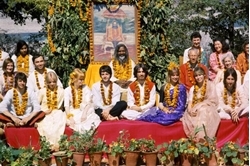 It will mark 50 years to the day that John Lennon, George Harrison and their wives Cynthia Lennon and Pattie Boyd arrived in India. A sitar used by the legendary Ravi Shankar will go onto display within the new immersive area, loaned to The Beatles Story by the Ravi Shankar Foundation. As George Harrison’s mentor, Ravi’s influence on the Beatle ultimately helped to popularise the use of Indian instruments in 1960s pop music. The exhibit will also include photography from Paul Saltzman, a sound engineer for the National Film Board of Canada at the time, who photographed The Beatles during their stay. He is responsible for some of the most iconic and intimate images of the Fab Four in India. Pattie Boyd, former wife to George Harrison, and her sister Jenny Boyd, who were amongst the star-studded list of attendees in India, will be providing their personal insight into the time. 2018 will also recognise what would have been George Harrison’s 75th birthday.